Conventional and cheap mattresses may be widely and readily available, but they are typically manufactured with toxic chemicals that could be making you and your family ill. It may be time to consider changing your mattress to a healthier one. A natural organic mattress is a good replacement for a deteriorating polyurethane foam mattress or a traditional innerspring mattress, and you should be able to find one that is designed to suit your sleeping requirements and the level of comfort that you want. Natural organic mattresses are made with only the finest organic and natural materials, straight from nature or from the field. 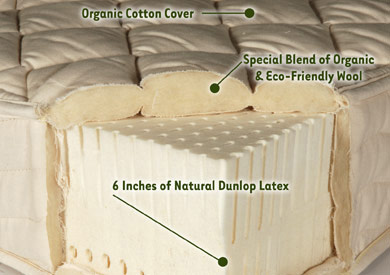 Natural organic mattresses are designed and made with your health, safety, and comfort in mind. Some of the best organic mattresses are made of natural Dunlop rubber or latex, which is very durable and can last for more than a decade without showing any signs of undue deterioration. Natural latex supports your body by following its contours and taking shape, thus preventing backaches and sore spots. This way, you wake up feeling completely rested without any aches and pains. The material is very resilient, so it can recover fast, and it will not sag or become deformed even after many years of use. Some of the discomforts you can experience while sleeping are caused by a mattress that becomes too hot or too cold. These problems are eliminated in the natural organic mattress. Natural latex can maintain a neutral temperature, and natural wool can effectively wick moisture away to keep your body cool in the summer. Likewise, wool keeps your body warm in the winter. Both organic wool and natural latex can repel dust mites, so you do not have to worry about waking up feeling itchy and irritable. 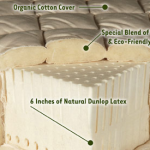 Be sure to buy a natural organic mattress a reputable store that is known for carrying a great selection of authentic natural organic mattresses from well-known brands. You can trust this kind of store to be honest and truthful when it comes to disclosing what their products are made of, especially if its owners adhere to the strict organic standards of the USDA’s Natural Organic Program and the Global Organic Latex Standard.